How do I know if I have Emerald Ash Borer? 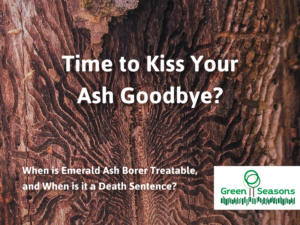 Well…..if you have an Ash Tree and it’s never been treated, then you likely have Emerald Ash Borer. There are 2 types of Ash trees that are common White Ash (Fraxinus americana) whose leaves turn red or purple in the fall or Green Ash (Fraxinus pennsylvanica) whose leaves turn yellow/gold in the fall. If you have any Green Ash, then it’s very likely that you have an infestation. If you have the White Ash, there is a good possibility that you don’t have an infestation…..yet. 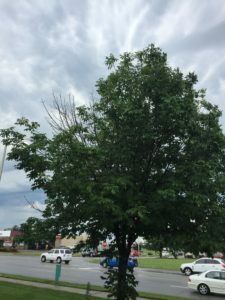 So far, in Missouri, the Emerald Ash Borer have heavily infested the Green Ash first while only moderately infesting the White Ash. With that being said, there are still thousands of White Ash that are infested with the bug. If you have an Ash tree in your lawn with dead branches anywhere on it, then you have an infestation of Emerald Ash Borer. It is estimated that the Emerald Ash Borer has killed more than 100 million Ash trees in North American. It has been identified in almost every state east of the Mississippi River and in many west of it. Because there is no natural predator to the Emerald Ash Borer, there is no hope for it dying out on it’s own. If you have an Ash tree in your lawn, there is a high risk of infestation. Can I prevent my trees from getting EAB? Yes, there a handful of products that have been proven to be effective in treating MINOR infestations and preventing further damage as well as protecting unaffected trees. Bayer has a product that can be used by the homeowner that will last for one season. There are professional grade products that have been show to be more effective than the Bayer product. These are restricted use and can only be applied by a licensed applicator. The benefit to the professional product is that it will last for 2 seasons. Are there other trees affected by the EAB? So far, White Fringetree (Chionanthus virginicus) is the only other plant that has been found to attract EAB. It isn’t as common used as the Ash tree, but I has been popular in several regions. How do I know if my tree is too far gone? If you are looking at your tree and you see more than 2 major branches, dead in the top of the tree, then it’s fairly safe to say that there is significantly more damage that’s going to show up. This is a depressing situation. We have not seen the destruction of a single group of trees like this since the Dutch Elm Disease wrecked the American Elm population back in the 1940s-1960s. Ironically, many towns replaced the loss of the American Elm with the Ash tree. Monitor your trees closely, folks! You don’t know how good your shade tree is until you have to cut it down!